To forge the future of health care, the new facilities at the Research Institute of the McGill University Health Centre, which opened its doors on Feb. 2, are helping to close the gaps between biomedical research, clinical medicine and population health. 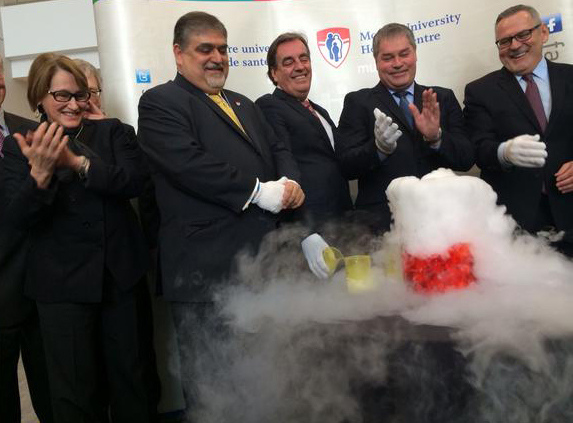 From left to right; During today’s inauguration of the RI-MUHC’s new facilities Principal Suzanne Fortier; Dr. Vassilios Papadopoulos (RI-MUHC); Mr. Normand Rinfret (MUHC); Mr. Yves Bolduc, Quebec Minister of Higher Education, Research and Science; and Claudio Bussadri (MUHC) enjoyed the good chemistry of the event. / Photo: Cynthia Lee. The Research Institute of the McGill University Health Centre (RI-MUHC), which opened the doors of its new facilities on Feb. 2, is at the forefront of a transformation happening in modern healthcare. Along with Dr. Papadopoulos, some of the dignitaries on hand for the inauguration included Principal Suzanne Fortier, Mr. Normand Rinfret, Director General and CEO of the McGill University Health Centre (MUHC), and Mr. Yves Bolduc, Quebec Minister of Higher Education, Research and Science. The complex nature of medical problems like diabetes, cancer and respiratory ailments demands that physicians and nurses work seamlessly alongside researchers to better understand diseases and to more readily leverage discoveries into new diagnostic tools, improved therapies and more strategic approaches to community health. The RI-MUHC is designed to serve this very purpose. The new state-of-the-art research arm of the MUHC super-hospital at the Glen site in Montreal – funded in part by the Canada Foundation for Innovation (CFI) – was created from the research institutes of five hospitals scattered around the city. The facility is made up of three main components: the Centre for Translational Biology (CTB), which carries out genetics research to understand the nature of diseases; the Centre for Innovative Medicine (CIM), the only facility in Canada where patients from the hospital can participate directly in clinical trials without having to leave the facility; and the Centre for Outcomes Research and Evaluation (CORE), which conducts population research to evaluate and improve the effectiveness of health interventions on society as a whole. Together, these centres will help bridge the gap between biomedical research, clinical medicine and population health. Health research is changing because society has changed; patients are as well informed as physicians about what treatments are available and in the age of genomics, medical science is advancing faster than ever. Papadopoulos, explains how the Research Institute of the McGill University Health Centre, where he is executive director, is at the forefront of this transformation. In 2001, pediatrician and epidemiologist Michael Kramer and his colleagues published the largest ever randomized trial on breastfeeding which followed 17,000 babies into their teenage years and showed links between how exclusively and for how long they were breastfed and improved cognitive development at an early school age. He has also conducted studies on the roles of induced labour and Cesarean delivery before labour in explaining international differences and trends in premature birth. Kramer will oversee these types of important population health studies as the new director for the Centre for Outcomes Research and Evaluation at the Research Institute of the McGill University Health Centre. Constantin Polychronakos has devoted his career to studying the genetics of juvenile diabetes and treating children afflicted with the disease. As head of the Child Health and Human Development Program at the Research Institute of the McGill University Health Centre, he is working towards new interventions to replace the need for painful daily insulin injections. Basil Petrof heads the program for translational research in respiratory diseases at the Research Institute of the McGill University Health Centre. His research group recently participated in a clinical trial that proved the efficacy of a new therapy that burns away the muscle tissue in the lungs of asthmatic patients to help open their airways. It’s this kind of cutting-edge discovery that Petrof expects will move more rapidly from concept to proven treatment thanks to the new facilities at the RI-MUHC. Find more stories of research in action on the website of the Canada Foundation for Innovation, where these podcasts originally appeared. Read more about today’s official opening of the new RI-MUHC facilities.